A one, and a two, and a three: Hanako's script and path direction is now complete! That means that it's also art recap time for Hanako's art. Hanako's art has, compared to the other characters, remained relatively stable. 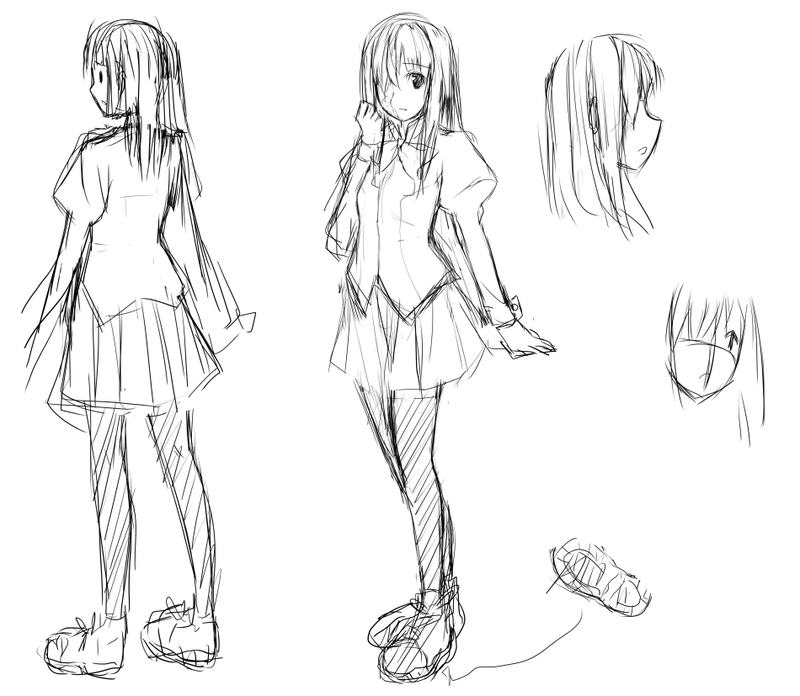 Since joining our art team in January 2008 alongside Moekki and Kamifish, Weee has been Hanako's artist and worked on her sprites and CGs since then. 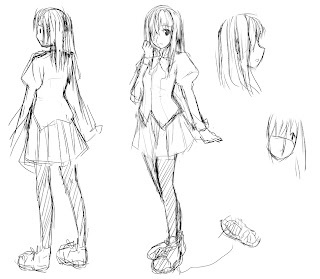 As can be seen in the above image, Weee also did a sketch of Hanako before joining, during the time that the game was in its brainstorming phase on the original now-defunct forums. She's been around for quite a while, with her art constantly improving (to the point where she has been selected to illustrate part of a Touhou doujin at Reitaisai 8! Go Weee (aka raemz at the site)!). When compared to Raita's original design, Hanako is not too different compared to characters like Lilly and Shizune. In Ke^4's sketches, a lock of hair was added to cover the scarred side of her face to give a little uniqueness to her design, and her hair was lengthened. These have since become staples of her design. Her stockings were decided upon to be black, both due to Raita's sketch and to create a ying-yang contrast with Lilly's white stockings. This touches on one aspect of Hanako and Lilly's designs; a desire for contrast. Not only are Lilly and Hanako very different people in personality, but their looks are used to further present their contrasting lifestyles. While Hanako is somewhat tall with a vaguely Asian beauty of long, dark hair, dark clothing, and a light frame, Lilly is taller, and fits a more Western type of beauty with long, blonde hair, fair skin, and blue eyes. Their expression sets, poses, and clothing all reflect their personalities and lifestyles. And so, that's Hanako. Thank god Crud and I can stop writing her path now, and good job Delta on finishing the direction. Please look forward to Rin and Shizune's updates in the future.